Delivering information that is easily understood builds trust and confidence between government and citizens. One of the objectives of the Open Government Initiative at NASA is to help improve the accessibility to and understanding of the information and data the Agency releases. One approach to this is to better visualize complicated datasets, with a particular focus on user engagement. We simply want to help share the compelling story behind the data we release. In our role at the agency, we are fortunate to have access to very interesting data sets. In November 2011, the Open Government team worked with members of the International Space Exploration Coordination Group (ISECG) to produce an infographic for their Global Exploration Roadmap. Since then we have been working with NASA’s Office of Chief Technologist to visualize their recently released Space Technology Roadmap. The Space Technology Roadmap graphically presents the wide range of technological investments needed to advance the nation’s space capabilities. The roadmaps outline in detail the 14 draft Space Technology Area’s that were reviewed by the National Research Council (NRC) and released in a final report on 1 February 2012. The roadmaps define the key new technologies required for our human and robotic explorers to safely venture into deep space, to better understand how our own solar system evolved and to unravel the mysteries of our universe. The first phase of this project is a graphic that represents the various technologies NASA needs to develop. 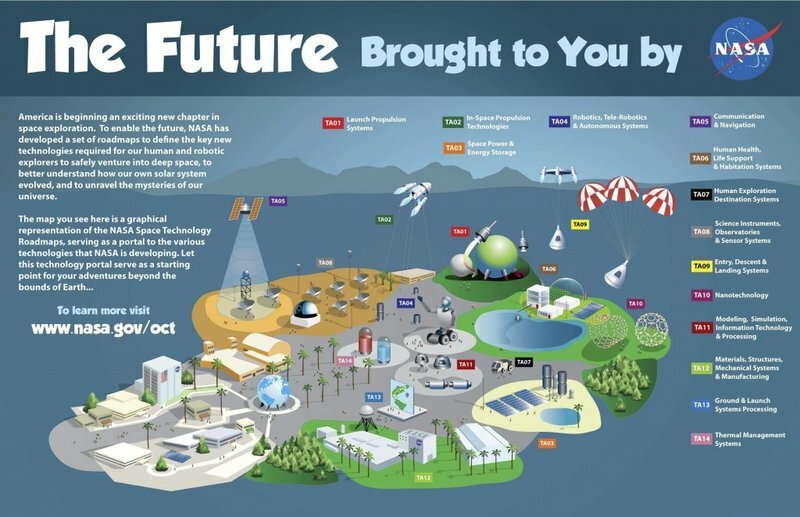 The graphic is meant as a starting point for anyone interested in the what the future of space exploration might look like. We plan to create a more interactive version of this infographic that digs deeper into each of the technology areas. The visualization is the handy work of the talented Dennis Bonilla, Tate Srey, Erin Bonilla, and Matt Scott, who have an unmatched ability to elegantly display complex data. We’ve worked with them on previously well received graphics and interactive systems.